What can I do if I experience a blood sugar crash? Living with low blood sugar sometimes means that after eating the wrong type of foods your blood sugar will unexpectedly crash leaving you with severe symptoms. 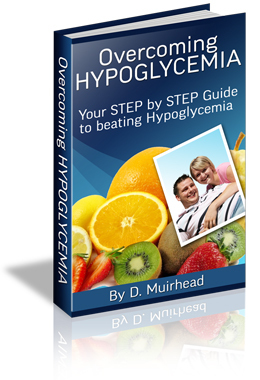 The Overcoming Hypoglycemia Ebook gives details of what to do when this happens and explains the fastest way to overcome a blood sugar crash, including which foods must be eaten straight after a crash to alleviate its effects and which hypoglycemic foods must be avoided. What can I do to help ease my withdrawal symptoms? Can I use protein meal replacement shakes as a meal? There is a lot of confusion regarding protein shakes and whether or not these should be used by Hypoglycemics to supplement their diet. In my Ebook I deal with these myths and highlights the truth about these shakes, revealing exactly what they are and whether you should use them or not. Can I use artificial sweeteners such as aspartame and xylitol instead of sugar? Many Hypoglycemics are confused about whether or not they should use any sorts of artificial sweeteners when attempting to stop using sugar as there seems to be much conflicting information available. My Ebook goes into detail explaining the pros and cons of artificial sweetners and allows you to make up your own mind as to whether or not you will use them in your diet. The above questions are just a few examples of the types of questions found in the Overcoming Hypoglycemia Ebook.The Ebook is a detailed comprehensive guide of over 100 pages filled with tips ideas and information all written to help sufferers fully overcome the condition.